Tomato Basil Pasta Sauce...a straightforward artisanal tomato basil sauce with an extraordinary light flavor! Simmer tomato basil pasta sauce & turn a humble plate of pasta into an out of the ordinary gourmet dish. This tomato basil sauce with a perfectly balanced blend of fresh basil & San Marzano Italian Plum tomatoes is perfect for a simple linguine & meatballs...the scent of the tomatoes simmering is mouthwatering! 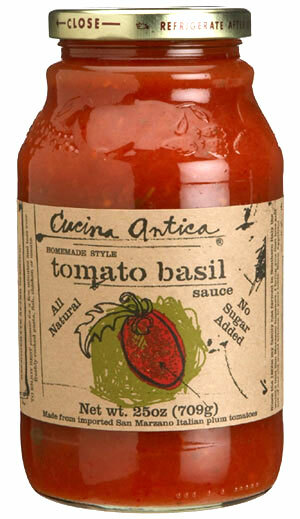 Cucina Antica all-natural pasta sauces, with old world cooking methods deliver a light, fresh & homemade taste! All of the Cucina Antica pasta sauces are made exclusively from world-renowned & imported SAn Marzano Italian Plum tomatoes, which they personally travel to Italy every year to hand select...the secret to the unique & unparalleled flavor lies within the tomatoes!!! Along with the irresistibly full flavored tomatoes is a special blend of fresh herbs & spices which gives the pasta sauces their light homemade taste. The sauces are shelf stable & are made in small batches to insure quality & consistency. Cucina Antica Pasta Sauces / Tomato Basil Pasta sauce. Less sodium comparred to other jarred pasta sauces. Ingredients: Imported San Marzano Italian Plum Tomatoes, fresh onions, Extra Virgin Olive Oil, Kosher salt, fresh basil, & pepper. All-natural, no sugar added, no preservatives.